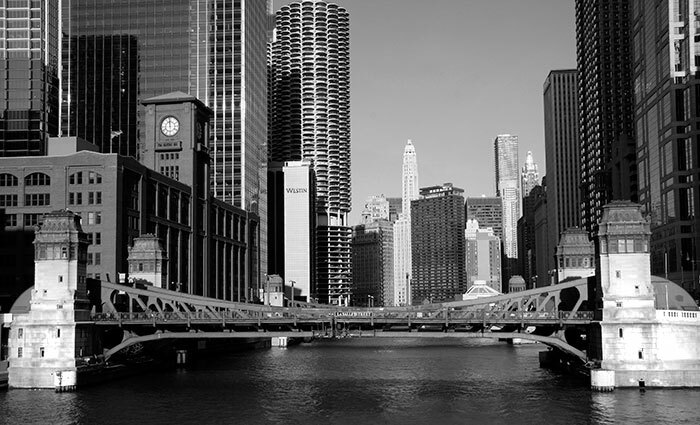 The Chicago River cuts through the rectilinear street grid of downtown Chicago. Its South Branch flanks The Loop to the west and to the north the Main Stem cuts across to link with Lake Michigan. Ten bridges cross each length and most of the photographs concentrate on the latter. This view looks east from the Wells Street Bridge with La Salle Street Bridge in the foreground. Completing a T form, the North Branch joins at Wolf Point behind the camera. Towards the end of the nineteenth century changes to the river system improved water quality and ship navigation whilst linking it and Lake Michigan to the Mississippi River. At the same time the flow of the river was reversed to carry river water away from the Lake. Early bridges were replaced and new ones constructed to improve movement across city streets. 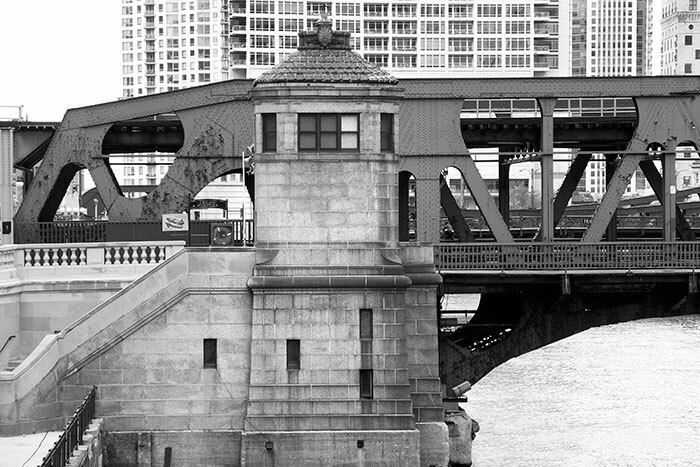 The Chicago River & Bridge House Museum and its history collections occupy one of the towers of this bridge. Bascule bridges have a long history but it was only the engineering developments of modern times that enabled large scale construction. Single or double leaf bridge sections pivot on trunnions, the weight of the leaf equalled by a landward counterweight set above or below deck level: these twenty bridges use the latter system. This balance enables small power sources to operate the spans. The multi-grey toned masonry of the Leo Burnett Building at 35 West Wacker Drive forms the backdrop. 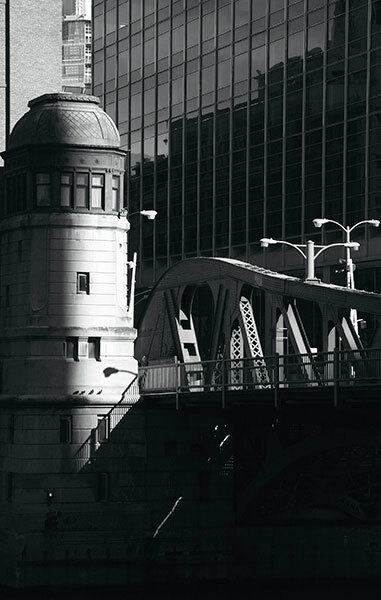 Chicago has the greatest number of such bridges anywhere and they are a major feature of the cityscape. Many of these twenty mentioned earlier were completed before the Second World War. The engineering principles are held in common but the structural forms vary widely in appearance. The dark form of the1971 IBM Building beyond was Mies van der Rohe’s final Chicago skyscraper. 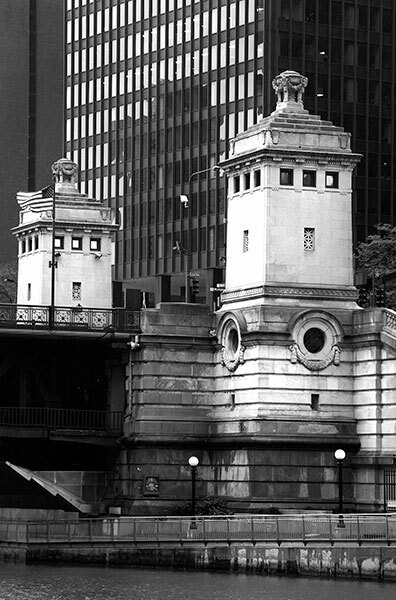 Towers are placed alongside each bridge, singly or in pairs on one or both banks. These are the “bridge tender houses” enclosing the machinery and the crews who tender to moving the spans. The houses vary in size, form and decoration and further enhance the unique features of each bridge design. As river traffic progresses, the bridges open and close in what seems a finely honed procedure. It would be fascinating to keep pace with the boats as they complete their passage, even more so to sail with them. Emerging from Union Station I once saw a short skein of yachts heading inland on the South Branch. Luggage dictated a static viewpoint and no photographs. Steelwork on Clark Street Bridge frames the La Salle Street Bridge towers to the west. Looking east, the La Salle towers stand against the rich red brick of the fine Reid, Murdoch & Company building completed in 1913. The block-long façade of the Reid building fronts the river. 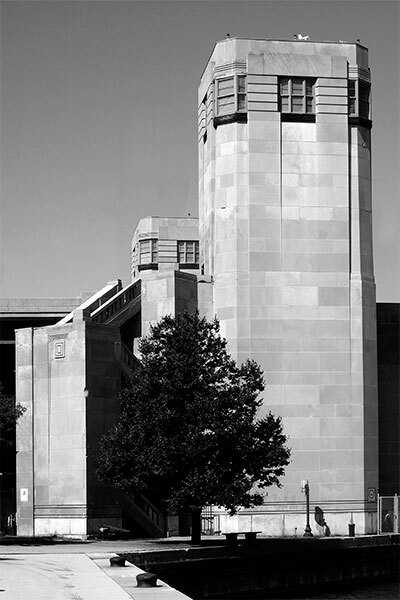 Its centrally placed clock tower also incorporates water tanks. 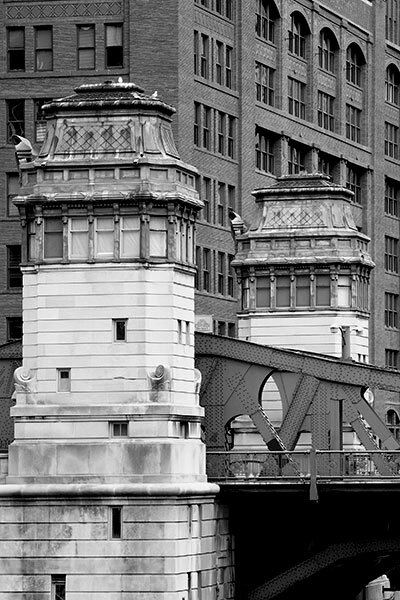 Images 12 and 13 in the CHICAGO STRUCTURES gallery show exterior cylindrical water tanks perched high above the roofs of their buildings and once a much more common city sight. The handsome stonework under intricately worked metal caps on these four La Salle Street tender houses is very different in style to those of the 1937 Lake Shore Drive (17, 18) and 1949 State Street Bridges (04). 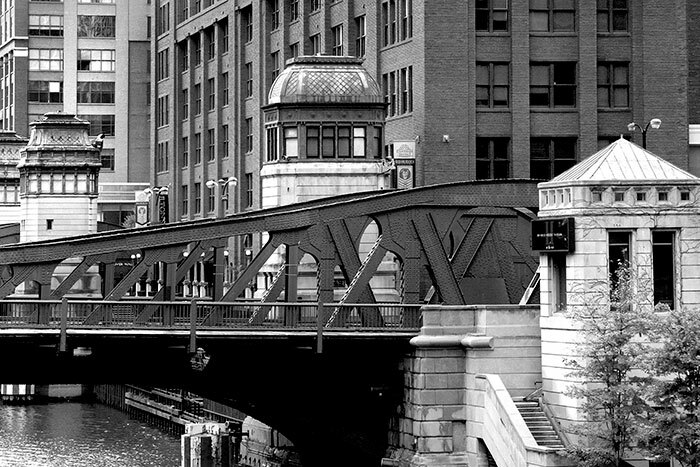 The double-decked Wells Street Bridge carries EL trains on top and road traffic below; the nearby Lake Street Bridge follows the same principle. 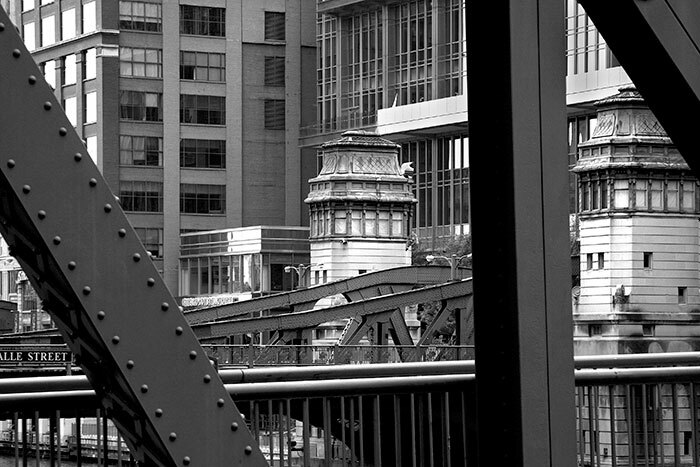 Brown Line trains through Merchandise Mart Station cross this bridge and follow a route above the street grid that returns them to the bridge and out to their starting point. Riding the L some three floors above the sidewalk is a novel approach to looking at architecture. 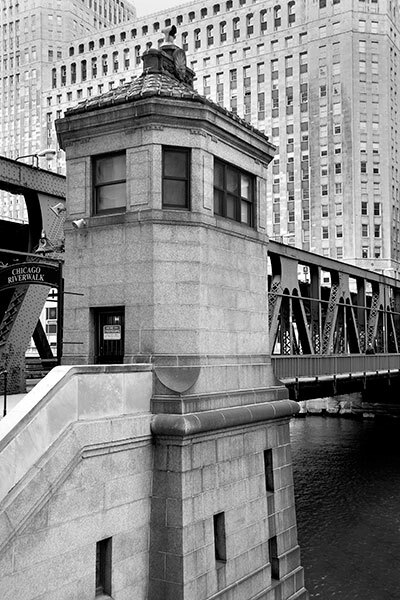 When completed, the Wells Street structure was the largest ever bascule bridge. Other images of it are in the CHICAGO STRUCTURES and the CHICAGO ARCHITECTURE & ELEVATED RAILWAY galleries. 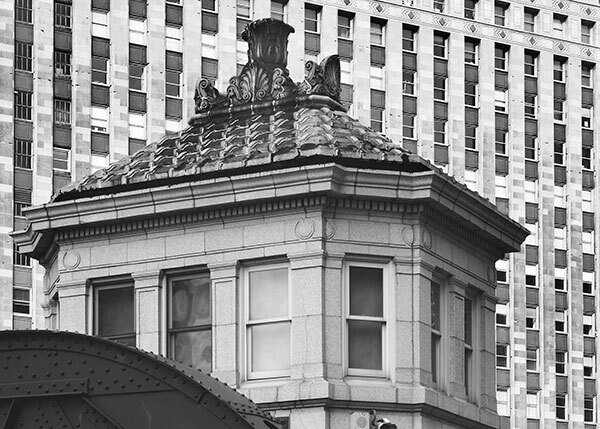 This is the top of the single tender house at the south-east end of the bridge on West Wacker Drive: the second house is set on its north-west corner. Its steelwork seems lighter and more elegant in construction than others. 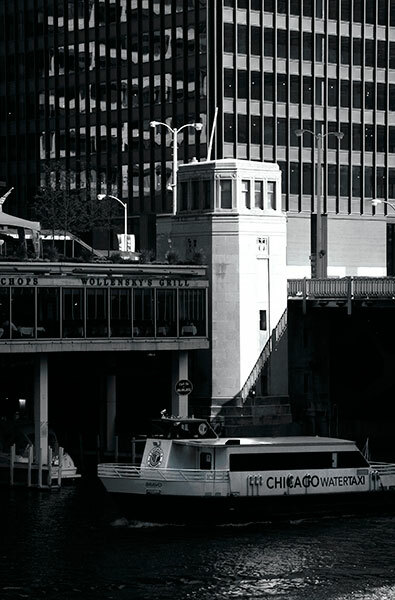 The great mass of the 1930 Merchandise Mart building stands behind. 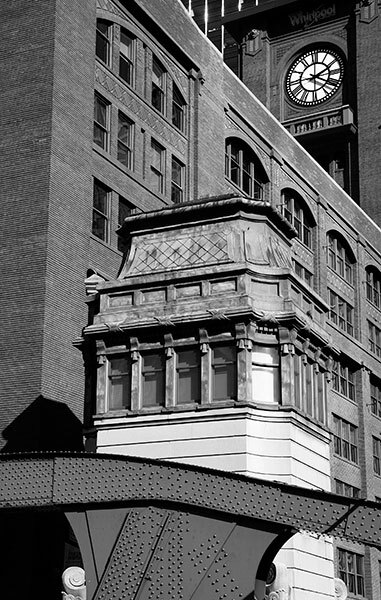 The old Chicago & North Western Railroad terminal at Wells Street was accessed by the adjacent Kinzie Street Railroad Bridge. This single span bridge crosses the North Branch of the river. The design of the one painted timber tender house has an elegant simplicity. 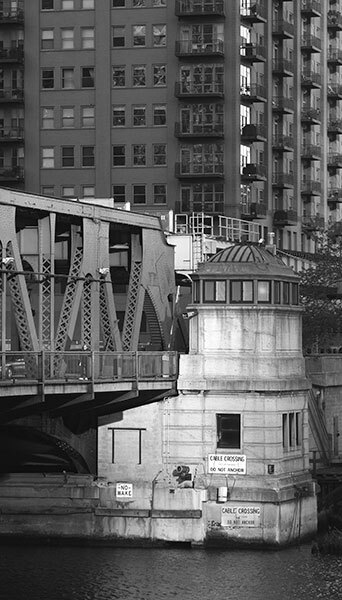 Close by is the much larger Kinzie Street Railroad Bridge built by the Chicago & North Western Railroad in1907. The upper counterweight design of that structure is massive and ungainly. 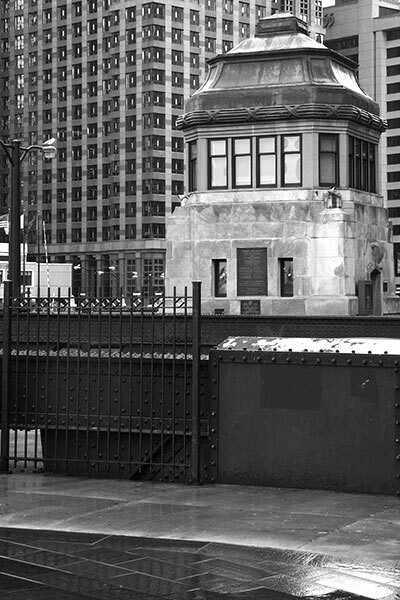 Forever raised, its gently rusting structure features as 05 in the CHICAGO STRUCTURES gallery. 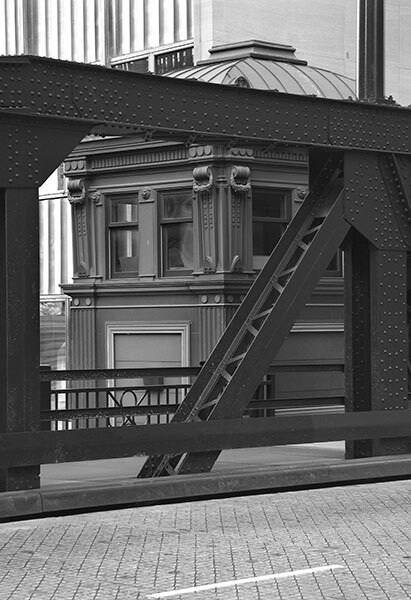 In 1893 the Lake Street Elevated Railway Company began operating trains on a route designed to link Oak Park to the west with a station at Market Street and Madison on the east bank of the river. An existing bridge was adapted for the crossing, to be replaced by the present structure in1916. 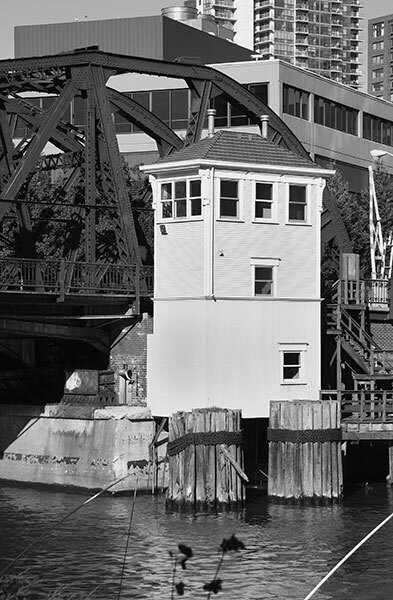 This was the first double-decked bascule to be built in the City. This bridge is on the South Branch of the river. The photograph was made after it had undergone extensive restoration. With the old paint removed, the sharply detailed steelwork carried a new maroon coat. The colour references earlier times when a black powder was added to red lead paint to tone down its bright hue. The timber-clad bridge house awaited renovation. This is a large double-decker bridge carrying the six lane Lake Shore Highway on its upper level and traffic linked to downtown on the lower. Pre-war, the areas north and south of the river at this point had railroads and industry and the lower deck was intended for trains. Tracks were never laid and the roadway was installed in 1986. 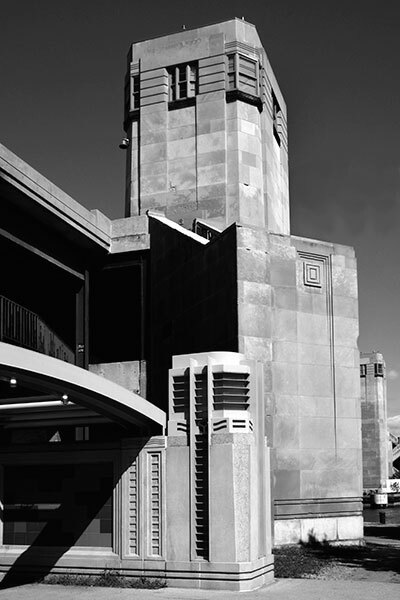 The Art Deco styling is unique. The historicbridges.org website presents concise biographical and technical details of these bridges. With contemporary and historical photographs the site should answer most questions one might care to pose.